Core Purpose: To nucleate and nurture technology and knowledge-based enterprises for India by leveraging the scientific and engineering competencies of the institutions in the region. Envisioned Future: To be the organisation that will be credited with creating, shaping and sustaining a "Pune cluster" of innovative technology businesses with a significant economic impact regionally, nationally and globally within the next 20 years. Specialty materials science products for various sectors such as packaging, infrastructure, automotives, lifestyle products. Nurturing businesses through their start-up phase by creating and running an efficient business incubator offering not only space but also access to technology support, business mentoring, networks, scientific and information resources, and a generally conducive and supportive environment. Promoting and running an active program for identification, creation, acceleration and translation (into practice) of technology ideas suitable for new venture creation. Run an active program in building and sharing resources, networks, competencies and special expertise in select areas at the interfaces of technology and innovation, business and entrepreneurship, and government and policy. Venture Center (trademark) is registered as "Entrepreneurship Development Center" under the Companies Act, 1956 as a Section 25 (not for profit) company. Accreditation: Venture Center has been accredited by Credibility Alliance (CA) under Desirable Norms - the highest level of accreditation offered by CA. This accreditation provides an independent, respected and credible recognition of the high standards of accountability, transparency and governance followed by Venture Center. 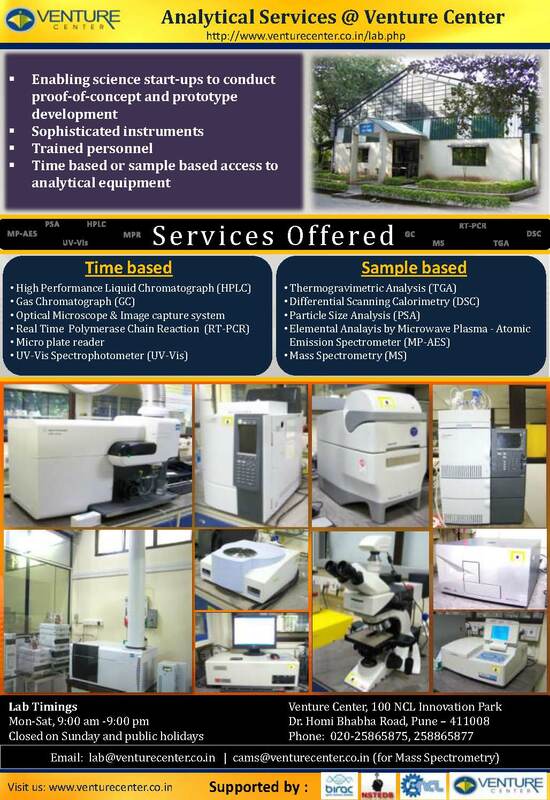 The accreditation positions Venture Center as the only technology business incubator in India with CA accreditation. 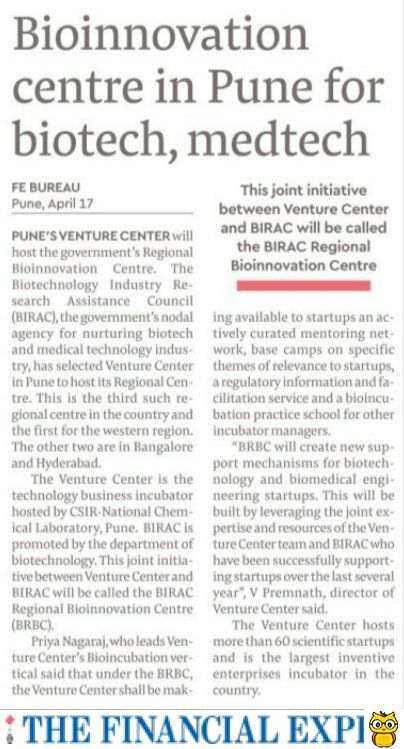 Council of Scientific Industrial Research, India (via the National Chemical Laboratory, Pune): The Venture Center is an initiative of the National Chemical Laboratory under CSIR's scheme titled "Scheme for setting up incubation centres in CSIR laboratories". The Venture Center is supported by the National Science and Technology Entrepreneurship Development Board (NSTEDB) of the Department of Science and Technology (DST), Government of India. Other partners are listed here.